Yes, this one is real! 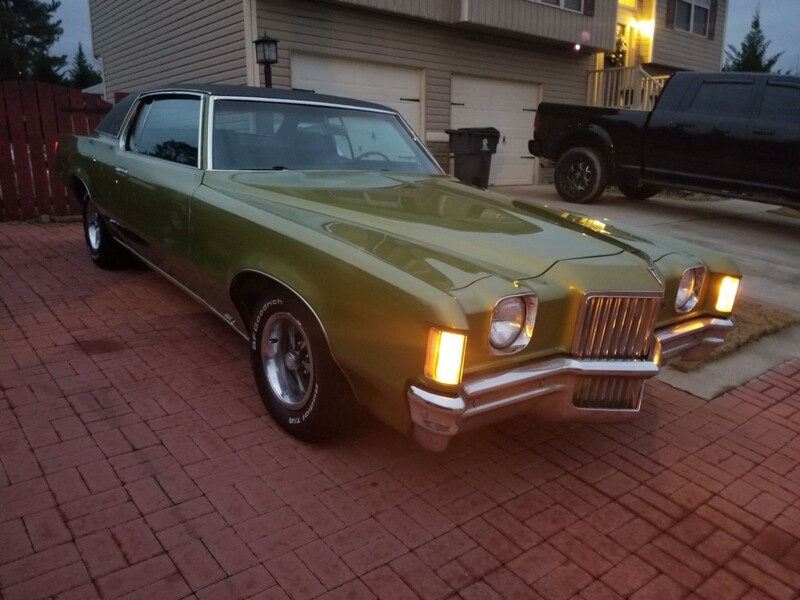 After having been specially ordered by a dealer right at the end of the model year, this 1977 Pontiac Grand Prix has been carefully stored for future generations. It’s listed for sale here on eBay and is located in Bernville, Pennsylvania. Bidding has surpassed $17,500 but has not yet met the reserve. The car is still wearing it’s original tires as far as I can tell! And I love the Rallye wheels. We’re also told it has the original window sticker and still smells like new. The interior has the vivid red that is usually faded so badly by this point it’s pink. Do you remember interiors like this? I’m thinking GM had the brightest reds, but feel free to disagree with me in the comment section. The underhood area is actually a little disappointing considering how gorgeous the exterior is, but remember that most finishes there aren’t “class A” anyway. And of course, this car is before the current fashion of covering everything with plastic shields. That being said, where else are you going to find a 42-year-old car that hasn’t even been broken in yet? Let us know if you’re a fan of this survivor! Interesting story, nice car. Horrid McDonaldland color combo. Good piece for a Pontiac museum or collector. Shame it wasn’t enjoyed much. Next to ’77, the ’75 was my favorite year. Loved the vertical grill on the tail lights. In 1998, there was a ’75 silver SJ with less than 3,000 miles for sale near me with the sticker still on the window. I wanted it, it was flawless except it looked like something was dropped on the hood causing a small dent. The whole car would have to be repainted because it’s impossible to match that silver paint (I don’t care what anybody says). Plus I just left a $500 deposit for a ’98 Z28 convertible custom order but could have forfeited that check….but that hood. “Every option available”? Not exactly; it has crank windows and no power driver’s seat. Unusual color combo for sure, but not loaded. The dealer should’ve ordered the glass moonroof instead of T-tops, which were passe by 1977. Also, if I were the ordering dealer, I would have mothballed a `76 50th anniversary edition instead of this. Would be far, far more valuable. Doesn’t matter, I can’t believe power windows were suddenly unavailable on the production line. So the end of the production line means you could not order one of the most popular options at the time on a Grand Prix or on most other GM cars which would have been power windows? Come on. We don’t buy that for a second. The car is missing some other key options as well. 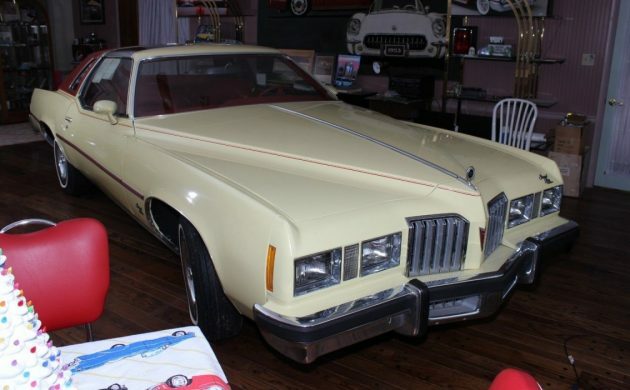 However, what is not to like about this beautiful T Top Grand Prix except for those stupid crank windows…. ….the color combo. Whatever it’s worth rip the value in 1/2 just for that alone. 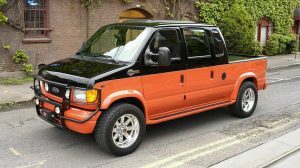 I’m from the Detroit area where these cars were VERY prevalent at the time and have never seen that atrocious color combo nor knew anyone that would drive it…not even a pimp. What, so Pontiac division was down to their last few gallons of this creamy yellow and offered it as a special thing to the dealership? Doesn’t seem to be a premium color and I always disliked the “color keyed” rally II wheels (instead of the basic black/platinum combo on Ponchos of this period). Agree about the T tops…and the heavy doors….with these few miles on the odo you are at a net loss if you start driving it for any great distance. Really should be on display in Pontiac, MI or at the Peterson musesum. Agreed, I never liked the color keyed rally wheels and on this one it just adds insult to injury. Looks like it already blew one of it’s headlights. I didn’t think that happened on those rectangular lamps until you reached 15k miles or end of replacement warranty! LOL :0 Agree about the McDonalds color choice. Not sure which era of automotive history that scheme would be considered luxurious or cool. A time capsule destined to remain on static display for the new owner. 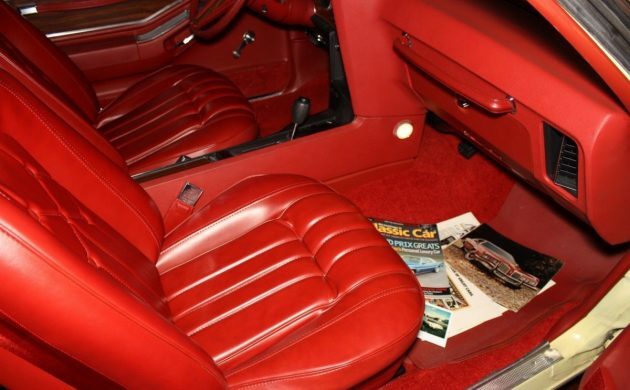 I agree with the comment about the GM red interior. My friends Dad bought a brand new 1965 Impala SS. Ermine white with lipstick red interior. I never forgot how beautiful it was. The color combo is pretty brash on a car of this era, but from the late ’30’s to the very early ’50’s (Before white paint became a thing in the middle ’50’s), this was a popular combination because it was one of, if not the most, pale colors available on a car. White paint had been around for 25 years in 1977, and white/red is a much better combo, but the creamy yellow/red might have been a familiar combo to seasoned/elderly buyers at the time. Very cool and great that it exists. But if you buy it what the heck do you do with it? It has too low miles to drive it without destroying the value, and would probably require the replacement of several original items to get it into driving condition anyway – belts, hoses, tires, rubber suspension components, fuel and brake lines, etc. It probably should be acquired by a museum. Honestly, I loved driving that car with that big V shaped hood with the ornament and because it’s so ugly with that color combo, I’d use it as a daily driver today. 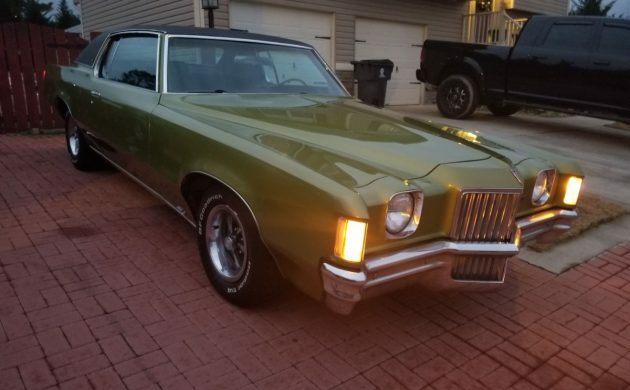 I bought a new ’77 GP in Berkshire green ( look like metallic blue @ night under the lights ) w/white landau roof green int. Great car! Sticker price was around $7500. Damn shame the seller put the car on Ebay. That will kill most dealer interest from buying the car as it’s already been on Ebay!!! This car could have sold privately and quietly for a lot of money. Very nice car but why in the world would someone buy a car like this (Millions Made Nothing Special Car) and not drive it? Just like most low mileage cars once you start driving it the value plummets. 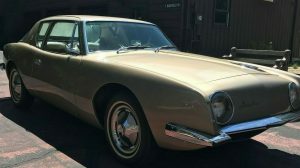 Lastly if you have the money to buy a car just to store for years then get something unique that you will know will bring in the big bucks. I was in High School when this car was new and I love all old cars. Every era had good and bad but looking at this now it’s a gorgeous car. Too bad you couldn’t just say “next” and move along with your negativity. This car wasn’t a Vega…..or a Chevette. Why not compare a Pinto to a Mark V? Furthermore, to many car enthusiasts, including myself, the cars of the 60s and 70s were the most exquisite in design. Anybody that had to settle for an 80s G-Body with a V-6 or some other crappy V-8 replacement other than a 350 or 400, ugly design and “downsizing” would have killed for this thing. 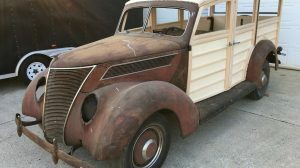 This has to qualify as the Barn Finds car in the best unrestored condition ever! The 1969-77 Pontiac Grand Prix had the coolest styling of that era. Try finding a personal luxury car or one that has a colorful interior today. The price is high but worth it for the right individual as a time capsule of when GM built beautiful and dependable vehicles. The little round knob fell off of many of those crank handles. I’ve NEVER had a car with a power window that malfunctioned or broke. I don’t know what people do to them. I’ve had over 15 GM vehicles new and used with upwards of 193K miles and on the latest one, if they didn’t want to fix the leaking window or the crumpled fender, or replace the wheel with a matching one, I don’t think they ever would have repaired a broken power window because all of them worked on a 12 year old car that was ABUSED. Bids are already way past its worth. Buy and drive it to summer shows. All software as mentioned will need replacing. what a nice gp . but i have been watching charlies angel reruns and i want that orange pinto with the orange plaid seats. anybody know where its at. No, but a dealer in either Oregon or Washington has a pale blue Mercury Bobcat with blue plaid interior with low miles. I think he wants $3900.00 for it and it is super clean. Really priced reasonably for 2019. Pinto have been climbing in price lately. This is a good way to have a Pinto without paying a Pinto price. If interested just go to Search Tempest and type in Mercury Bobcat. It will come up. I want a Levi’s Edition AMC Pacer. Love this car. Interesting that it has almost no miles on it. Does that really make it worth a fortune? 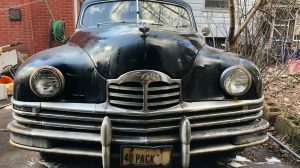 I have a 1952 Dodge with 8000 miles on it, but I promise, it will never bring big bucks even though it looks like new. Beautiful car. If I’m not mistaken, I think it’s a 301. Too bad. Neat car, but it’s basically a large paperweight, given that it hasn’t been driven at all. All the fuel systems, braking systems, etc will be toast on the car. Neat example of how they used to be built and should be a museum piece. I know this car it is a good friends dad’s car & has been sitting in his barn covered up since new . He had the barn full of cars on both floors ,he also had a 57 vett in his living room, metropolitan in the grandkids play room . 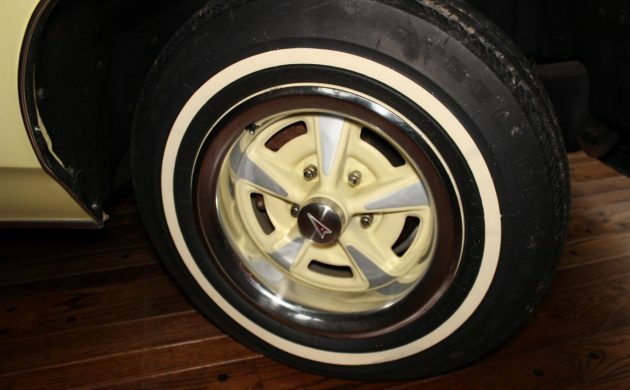 I owned a 1977 Pontiac bonneville that was the same color and had the same wheels. The 301 v-8 was a dog but a solid car for the time. Nice car except for the color. It would be great in black, white, or red with the red interior. Too bad so much effort was made to save a relatively lack luster car. Better if it had been a GTO or something more popular. 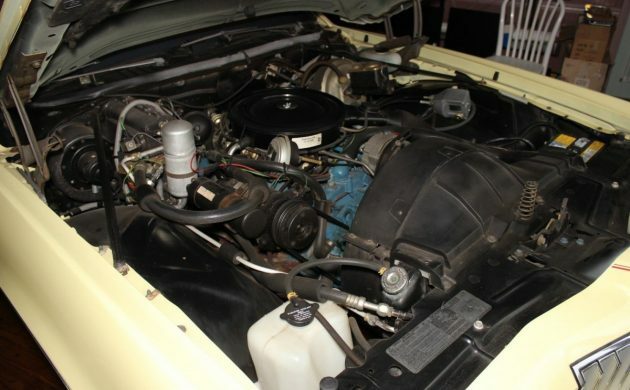 In December 1975 I ordered a ’76 Grand Prix SJ with every non-conflicting option except the 455 and automatic temperature control AC, preferring standard air. Moonroofs we’re not available; the electric sunroof was a bargain at $370. The moonroof on a Cougar was $900. I ordered Starlight black with, yes the red interior and red pinstripes. I would like to think I have better taste now. The salesman had me fill out the order form, saying he knew I would refuse delivery if he made a mistake. Good times then, being able to order almost anything you wanted. The year before I had ordered a ’75 Chevy Monza with uncommon options. Wow, I special ordered an ’84 Cutlass and remember the sunroofs were like a luxury then when EVERY car didn’t have them and they were upwards of $1,000 or more. Anyway, I ordered that car with every option, including the lamp monitors on the hood…..but forgot power locks. Anyway, good thing it was a 2 door. I love it, And it doesn’t have a tree growing in the trunk. Crank windows? What’s wrong with crank windows? Hell, this generation loves to go to the gym to work out, but won’t buy a car with crank windows that require physical effort to roll up. Because they were ugly. And that GP in particular had that door panel designed for the power window switches as an extension of the armrest so if you didn’t have them it really looked “off”. Like the ’79 Sunbird my sister had without A/C and those black blocks are just in place of the vents. Nothing like a car with all those blanks for options you didn’t get or couldn’t afford. Is it just me or is this car in the guy’s living room? It’s probably the “man cave”. My sister bought a house with an outbuilding they called a “studio” that was a living room with a skylight and attached storage room. You can tell it was the original 1 car garage and they built a 2 car garage closer to the house. I’m sure it’s where the hubby went when he had had enough for the day. On the subject of man caves—I could think of better vehicles to keep dusted, step around, and stare besides this year GP. Really just a hunk of malaise metal destined to be a museum piece instead of driven as intended. Not even a good conversation starter after getting over the initial shock of its preserved status. I know of someone with the fronts and backs of vintage cars being used for outdoor grilles and wall art. Why take up all this floor space? The useable square footage is precious in realtor circles. Wow, this really brings back some great memories. in 1977 I ordered my first new car. 77 Gran Prix SJ, Red with White interior and white padded landau roof. this one is very nice. Beautiful car. I love the styling of these and this color combo is really cool. Esp compared to today where everything is black white or silver. Oh, and the sticker price on the aforementioned 1976 Grand Prix SJ with 400 4bbl, black w/black padded vinyl roof (yes! it was the 70s) on red cloth, loaded with sunroof and honeycomb wheels? $8063, out the door for $7300. I remember when my brother in law came over with his new ’79 Trans Am and it was the first car we saw with a $10,000 (!) sticker price. And it didn’t even have T-tops or the honeycomb wheels, just power windows and a tilt wheel. Engine will have to be rebuilt. color combo awful..not that collectable. Nice car, not buying the 176 miles… bid up to 27k, not worth that, better cars out there for that kind of money. My first GP was a ’73 with white interior. I bought it when I was 16 in 1979. Wrecked it several times! Replaced parts and kept driving it. My “newest” is a ’72. Fun as heck to drive. 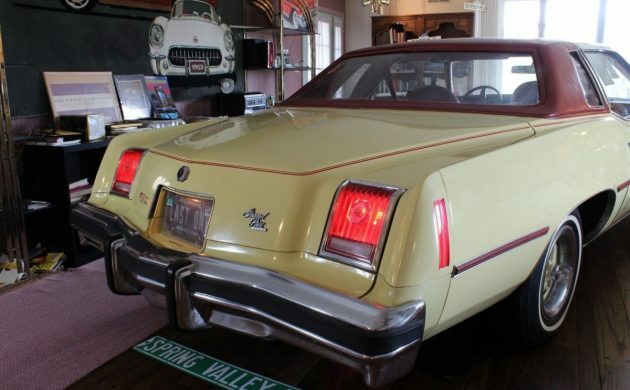 I loved the back and tail lights on the ’72…..and those exterior door handles. A cousin had a GP of this body style, before the GP became a tarted-up Chevy. The 400 engine was a torquer. Many folks do not understand the 301 through the 455, even the SD, was basically the same block design with minor casting differences. My concern is how often was the engine run, and how often were the fluids changed over the years? I would want it to drive, rather than as a museum piece. I try not to be negative, honestly I do. If this poor car was alive it probably would have found a way to commit suicide within the first year out of shame and embarrassment. HOW could they do that to such a nice looking body style car? Even Yugo didn’t do anything this….questionable? Yeah, Saul, lighten up. This made someone a great coaster/cup holder for over 40 years!